Who says winter means you have to stay indoors? Winter is officially upon us in Walworth County! The snow and chilly temperatures may have been slow coming, but they are here now, and we have the dish on TEN ways to live it up this winter in the Lake Geneva area. With 11 skating rinks right here in Walworth County, you’re sure to find a rink close enough to home. The hard part will be choosing which one to go to first! If you have your own skates, one of the many local park rinks will be a great option. Park rinks in the area include: Devor Park and Echo Veteran’s Memorial Park in Burlington, Wildwood Park in Darien, Veteran’s Memorial Park in Delavan, Library Park in Lake Geneva, Rotary Park in Walworth, and the Skating Rink at Pier 290 in Williams Bay. If you are in need of skate rentals, we recommend skating at one of the local resorts. Local resorts with skating rinks and rentals include Lake Lawn Resort, The Abbey Resort, The Ridge Hotel, and Grand Geneva Resort. The Lake Geneva area hosts 12 local sledding hills that are perfect for that downhill slide after a good snow. Many of the sledding hills are located at local parks and trails. 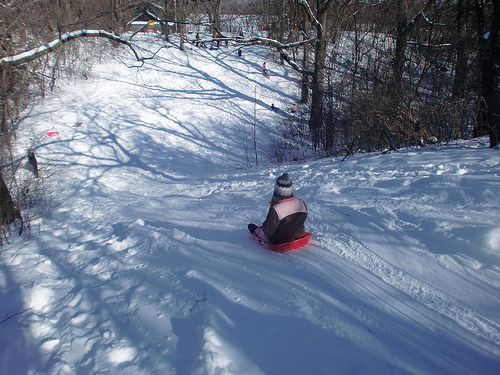 To view a full list of each hill in Walworth County, check out the Places to Play: Sledding section of our website. With so much stunning scenery in Walworth County, snowshoeing is a favorite winter activity in the area! If you have your own snowshoes, there are a variety of parks and trails that have scenic paths for snowshoeing. Should you need a rental, there are plenty of options throughout the county to rent a pair before you hit the trails. Rental facilities include Backyard Bike & Ski Shop, Clear Water Outdoor, Fontana Paddle Company, Grand Geneva Resort, and Lake Lawn Resort (please note that resort rentals are for on-property use only). If you like to be social when you snowshoe, then you might want to sign up for one of Clear Water Outdoor’s Snowshoe Socials, hosted every second and fourth Saturday of the month at Big Foot Beach State Park. The White River Bike Trail in Elkhorn is a 12.6 mile railway corridor that was transformed into a bike trail. In the winter months, it is a favorite local snowmobiling trail. The Elkhorn trail head is located off of Highway H, and runs from Elkhorn to Burlington. Trail passes are available at the County Highway Department, the Walworth County Visitors Bureau’s Visitors Center (in Delavan), and the Elkhorn Chamber office. For information on more trails throughout Walworth County stop by the Visitors Bureau to pick up a Trail Map, or visit our website or call (262) 728-6000 to have one mailed to you. Lake Geneva Canopy Tours has an Eco Adventure for everyone! Explore their expansive 100 acres at whatever pace you want to set. If you really want to get the blood pumping, traverse 8 different zip lines, 5 sky bridges, 3 spiral stairways and climb a one-of-a-kind “floating” double helix stairway while on their world class Canopy Tour. Bring the family, grab a group of friends, or go solo. It is a different kind of winter fun that will leave you wanting to come back for more. Get your adrenaline pumping with some fast slopes in Walworth County. Alpine Valley Resort has over 90 skiable acres with 20 Runs, a vertical drop of 388 feet, and the longest run being 3,000 feet! The steepest run is Big Thunder and the longest slope is Alpine. PLUS, they are the only resort in Southeastern Wisconsin that features on-site ski-in/ski-out rooms with a full service Bistro for dining and free weekend family movie nights. The Mountain Top at Grand Geneva Resort is also one of Wisconsin’s premier ski destinations. Whether you’re a first-timer or an avid enthusiast, you will find a great skiing experience! Their 18 exciting runs go up to a quarter mile in length, and are suitable for skiers of every ability level. Rentals are available if you need them, AND they have fantastic weekday ski specials that include $20 Tuesdays, 1/2 price rental Wednesdays, and 2 for 1 Thursdays. Experience the back country of the Lake Geneva area. There are many trails and parks throughout the county ready for cross country skiers. Local trails and parks that are groomed for cross country skiing include the Southern Unit of the Kettle Moraine State Forest in Eagle, the Duck Pond Recreation Area in Fontana, Big Foot Beach State Park in Lake Geneva, and White River County Park, also in Lake Geneva. A few local resorts also have scenic acres to accommodate cross country skiers. Lake Lawn Resort in Delavan, Geneva National in Lake Geneva, and Grand Geneva Resort in Lake Geneva each have beautiful properties to cross country ski on, and offer rentals for on-property use. Need to rent equipment before skiing some of the local trails and parks? Clear Water Outdoor and Backyard Bikes can both hook you up with everything you need before you hit the trails. February 12 – 14 Delavan will come alive with FREE winter fun during the 3rd Annual Sky Circus on Ice. Hosted at Lake Lawn Resort, the weekend spectacle will feature exciting airborne performances by professional kite teams from across North America, plus snow sculpting and ice carving by top regional artists. Additionally, there will be kite making workshops and bunches of other super fun activities for all ages. The ONLY National Snow Sculpting Competition in the country will be in Lake Geneva February 3rd – February 7th. This event has been hosted in Lake Geneva for over 20 years, showcasing the best snow sculpting teams from across the country from Vermont, New York, New Hampshire, Colorado, and Alaska to the surrounding states of Illinois, Iowa, Minnesota and Wisconsin. As if the phenomenal snow sculpting wasn’t enough, this event also has a huge array of crazy fun activities over the week that include an ice bar, human dog sled races, cocoa crawls, chili cook-offs and more! Last but not least, one of the most entertaining ways to have Snow Much Fun is to be a kid again and just play in the snow! Bundle up, grab the kids and head to the backyard, or a favorite park and just play in the snow. Build a snow fort, lay in the snow and flap your arms and legs to make a snow angel, or start rolling snow balls to create the best snowman ever. No kids? Who cares! Just get out there and play! Did you do it?! If you did, take some pics of your snow angels, snowmen or snow forts and share them with the Walworth County Visitors Bureau! You can find us on Facebook, Twitter and Instagram. Free to the public; bring your own sled! Located near the old railroad bridge, near the parking lot at the intersection of Sage & Mill Streets. Open 9:00am-dusk, Monday-Thursday for general public. Open daily for resort guests. FREE for resort guests. Non-resort guests pay $8/first hour and $3/additional hour; fee includes sled rental. Do you have a sledding hill to add to this list? Let us know! Comment below with the hill name & location. For a full list of winter activities, year-round fun, and our Events Calendar, visit our website. If you are coming to the Lake Geneva area this winter, make sure you get your Snow Much Fun Coupon book – request yours HERE! There’s “snow” much to do in the Lake Geneva area! It may be March, but the snow is still flying in Walworth County. Our sledding hills, ski slopes, and skating rinks are looking great, so why not get outside and enjoy our great county?! There is no shortage of ice skating rinks in Walworth County! The Abbey Resort has a rink that is free for public use. Skates are complimentary for resort guests or $2 per pair for non-resort guests. Grand Geneva Resort‘s rink is free for resort guests. Non-resort guests can use the rink for $8 for the first hour & $3 each additional hour. This fee includes the rental and rink fee. Lake Lawn Resort offers free skating on the frozen Delavan Lake (weather permitting). They also have skate rentals available for $5 per hour. Geneva Ridge Resort has a skating rink in front of the resort that is free to the public & resort guests. Skate rentals are $5. Pier 290 in Williams Bay also has a free public rink, provided you bring your own skates. The Library Park in Lake Geneva offers free skating on the frozen Geneva Lake; just bring your own skates. The Rotary Park Ice Rink (Casey Street in Walworth) is free to the public as well – just need your own skates. If sledding is more your style, there is free sledding at the Rudy Lange Sledding Hill (intersection of Washington St. & Terrace St. in Delavan) and at the Lake Geneva Sledding Hill (intersection of Sage St. & Mill St. in Lake Geneva). Both hills are open until 10pm daily; bring your own sled and have fun! Grand Geneva Resort also has a sledding hill open to the general public Monday-Thursday until dusk. $8 will get you a sled rental & one hour of sledding; you can pay an additional $3 for each additional hour. Walworth County is also home to two great ski resorts: Alpine Valley Resort and Grand Geneva Resort. Go to their websites for pricing, information, and slope conditions. For a complete listing of snow activities in the area, click HERE. Now get out there & enjoy the great outdoors!